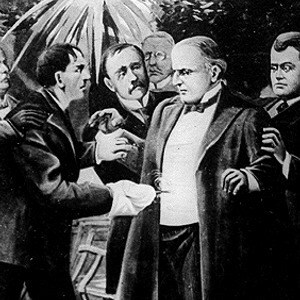 The man who, on or about four o’clock in the afternoon of September 6, 1901, fired two shots at point blank range into the stomach and chest of the 25th President of the United States, William McKinley, was a short, slight, self-proclaimed anarchist, age 28. He liked to call himself by an alias, “Fred Nieman”: Fred Nobody, is how he translated it, and almost how he signed this phenomenally rare letter, “Fred C. Nieman.” Once a hard-working factory hand, he had a breakdown in 1898, and returned to the small family farm outside Cleveland. There he tinkered, shot rabbits, slept inordinately, and argued with his stepmother about religion; he read radical newspapers, and joined anarchist groups, by whom he was suspected of being a spy. Withdrawn, irritable, he managed to get enough money from his family to quit the farm in July and move to West Seneca, in the vicinity of Buffalo. It was from that place he wrote this letter – to John Grinder, a member of the Golden Eagle Lodge, and an employee of the wire mill where Czolgosz had once worked. Inclosed you will find One Dollar, to pay my Lodge dues in June I gave one Dollar to brother George Coonish to pay my Assessed on the death of our late Brother David Jones, and I was up the hall that night and i give one Dollar to our brother at the first guard Room to pay my Lodge dues and I said to him that you have got my book. brother Grinder will you send my book to me at my cost and send me the Passwords if you can do so. I left Cleveland Thursday July 11th I am working here I will stay here for some time, and the street car fair [sic] from here to Buffalo is five / 5 cents. Hoping this letter will find you well as it leaves me at present. Czolgosz left West Seneca in late August, no one knows why, and after a fleeting visit to Cleveland, relocated to Buffalo on the 31st. There he waited for McKinley to arrive on September 5th. Then he followed the President to three locations, before finally getting close enough to kill him. Afterward, he did not try to get away, and freely confessed his heinous deed. “I done my duty,” he said, explaining that he didn’t believe “in presidents over us.” His trial, just a little over a week after McKinley succumbed to his wounds, lasted 8 and a half hours; his execution, a month later, took a minute. Sulfuric acid was thrown on his body; his letters and clothes were burned. “Fred C. Nieman” was, officially, nobody. Autograph Letter Signed (with his alias “Fred C. Nieman”), 2 pages, octavo, recto and verso, datelined Cleveland, Ohio, but very possibly sent from West Seneca, New York, July 30, 1901. To John Grinder in Cleveland, Ohio. In red ink, Of the utmost rarity.